by Thomas E. Mann and Norman J. Ornstein. New York: Basic Books. 226pp. Cloth $28.00. ISBN 9780465031337. This book took courage to write. Mann and Ornstein are familiar names to political scientists and, until this book came out, were among the most publicly visible members of the profession. That public presence is now considerably diminished, largely due to their decision to place their professional analysis of national politics in the United States ahead of their careers as media intellectuals. For they have crossed a line in public discourse that our privately owned national mass media has still left drawn in the sand: a requirement that all commentary about political gridlock, especially about conflicts in Congress, be “even handed” in laying blame. To their credit, Mann and Ornstein allowed the data to guide their conclusions instead of this blatantly commercial limitation. But I am getting a bit ahead of myself; before I lavish any more praise on our authors, it might be wise to outline their argument. Some readers may be wondering why a book about policy gridlock in Washington is being reviewed here. After all, LPBR is largely dedicated to works on constitutional and legal interpretation. But that is what Mann and Ornstein’s work is about, pitched at a slightly higher level. What they are concerned about is an increasing deviation between the processes used by the governing institutions in the Constitution and our increasingly polarized political processes. That deviation is, in their view, making the country increasingly hard to govern at a time when it faces immense economic problems. As might be expected from their earlier work, Mann and Ornstein concentrate on gridlock in Congress. This is not the only way to address problems attendant on political polarization, but it is probably the best starting place. The numerous veto points, both constitutional and contrived, our Madisonian presidential system places in the path of legislation have been a headache for policymakers in both the executive and legislative branches since the founding of the republic. Until recently, however, the obstacle course could be run with at least some success. The policy differences between parties were real, but a respect for electoral results, more ideological cohesion between the parties, and a pragmatic sense that winning some of what your adherents want is better than consistent [*176] defeat made partisan use of veto points less dangerous. However, as Mann and Ornstein point out, these assumptions about our constitutional order no longer fit how our political process is evolving. The main problem is exactly what the American Political Science Association called for in 1952: more responsible – i.e. more unified and ideologically coherent – political parties. As Mann and Ornstein present it, the root of our present problems was the long period of Democratic control of the House of Representatives from 1955 to 1994. This was a period of frustrated ambition for the Republicans, especially after the victory of Ronald Reagan in 1980. Control of the presidency delivered some policy changes, especially on tax issues, but not the sea change that the party’s core partisans hoped for. The Democrats controlling the House remained a major barrier. The rise of Newt Gingrich and the slow replacement of Southern Democrats changed all that. As Mann and Ornstein say, Gingrich was willing to exploit Democratic vulnerabilities built on a combination of arrogance, expectations of inter-party cooperation, and traditions of civil political discourse by using a strategy of relentless and rancorous political attacks on the Democrats’ policies and their leadership of the House. Gingrich’s rhetoric was also adopted by an increasingly raucous right-wing media. When the Republicans won the House in 1994, Gingrich was hailed, justifiably, as a political genius. That he would be castigated by his descendants as insufficiently conservative and insufficiently separated from his life as a “Washington insider” is poetic, but predictable, justice. Mann and Ornstein argue that Gingrich was merely the political tool that enabled the party sorting that accompanied ideological changes in the electorate and the increasing willingness of outside interests to corrupt the political process with larger and larger amounts of money. Add in the Citizens United decision and you have the recipe. The dish itself is characterized by an increasingly radical and intransigent Republican party. It is at this point that Mann and Ornstein took the risk that has so damaged their presence as public intellectuals. The precipitating event for their decision was the near-brush with default that the United States went through in 2011. The willingness of the Republicans to convert legislation to raise the debt ceiling, before an innocuous opportunity for temporary grandstanding and inevitable acquiescence, into a weapon of political combat distressed them. The candid admission by the newly radicalized Republican membership in both houses that they were willing to risk the destruction of the country’s credit for the political advantages it might give them in the 2012 presidential contest, and their consistent undercutting of any attempt by their leadership to reach a solution based on good faith bargaining, was as alarming to them as it was to the electorate and, not coincidentally, Standard and Poor’s. Add in Senate Republicans’ extensive use of filibusters to delay legislation (all legislation) the president supported. Now include the use of holds and filibusters of appointments to hamstring the executive and judicial branches by denuding them of personnel and to extort legal changes in new laws by refusing to appoint personnel to new agencies until their demands are met. Given the evidence [*177] and despite the obvious failings of the Democrats, it is no wonder that Mann and Ornstein spat on their hands, hoisted the black flag, and labeled the Republican party as “… an insurgent outlier … ideologically extreme; contemptuous of the inherited social and economic policy regime; unpersuaded by conventional understanding of facts, evidence, and science; and dismissive of the legitimacy of its political opposition, all but declaring war on the government” (p.103). The result – the exclusion of both scholars from many of the outlets for their public presence – has not been edifying for those who might still hold illusions about the willingness of Washington’s political and media elites to entertain a clear-sighted and professional assessment of our political situation. That, of course, has not stopped Mann and Ornstein from providing one; indeed, half of this book is dedicated to proposing measures that will ameliorate the increasing dangers stemming from the asymmetric emergence of a parliamentary-style party in a Madisonian system. They begin by distinguishing four “bromides” concerning the challenges caused by the present impasse. The first is the most substantial and well supported: the observation, true as far as it goes, that American politics has seen highly polarized parties at loggerheads before and has pulled through to more normal politics despite it. They personify this position by referring to David Mayhew’s (2011) Partisan Balance: Why Political Parties Don’t Kill the U.S. Constitutional System. Mayhew makes a strong argument drawn from historical data that similar imbroglios have been overcome before and that the record of legislative success in recent presidencies has closely tracked past experience. Mann and Ornstein agree with Mayhew’s evidence, but point out that the asymmetric radicalization and reckless obstruction seen recently simply do not track the comfortable assumptions in Mayhew’s work. They then make short work of such suggestions as a third party intervention (the electoral system and the electorate’s actual partisan identification makes this unlikely to work), a balanced budget amendment (a recipe for economic disaster if taken seriously, but there is no evidence that either party would), term limits (unnecessary given recent turnover and, again, there is no evidence that either party takes this seriously), and exclusively public financing of elections (once more, neither party – not to mention the Supreme Court – would agree to this under present circumstances). With their deck cleared of what they consider less serious solutions, Mann and Ornstein are free to make suggestions about fixing the party system, reforming our political institutions, and reconstituting our political culture. The reforms they describe for political parties are grouped around three areas. First, they call for expansion of the electorate by vastly increased use of electronic voting, by opposing suppression of registration through voter identification, by expanding the periods available for voting, and by considering making voting mandatory. It is interesting that the central theme of Mann and Ornstein’s endorsements is the partial nationalization of elections (e.g., using a separate ballot for federal elections, a new voting rights act canceling recent [*178] suppression efforts, national election day registration). Second, Mann and Ornstein are in favor of more representative voting systems. Here the scope for national options is more limited. Despite a healthy skepticism concerning the effect of gerrymandering, they recommend redistricting reform, particularly by using independent commissions to draw district boundaries. They also believe that open primaries should be used more widely and that there should be more exploration of using preference voting. Finally, they call for more curbs on campaign funding by passage of a beefed-up DISCLOSE Act, action by the IRS to clamp down on “Super PACS” using existing regulations, eliminating “leadership PACS” and contributions to campaigns by lobbyists, and changing public funding to more strongly subsidize campaigns that draw on small donors. When it comes to reforming our political institutions, Mann and Ornstein recommend a more direct approach. First, they call for recasting Senate rules to return to a more classic form of the filibuster, eliminating extended debate provisions and forcing minorities to hold the floor to maintain opposition. They also call for a strict 60 day limit for executive nominations to reach the Senate floor for an up-or-down vote. (This would not apply to judicial nominees.) Second, Mann and Ornstein support the inevitable: more use of executive power to remove contentious policy decisions from a broken legislative process. Here, however, they recommend extending the use of independent boards and commissions like the PPACA’s Independent Payment Advisory Board. This seems to be calling for an almost Scandinavian separation of policymaking and implementation through the use of administrative boards. What are we to make of this wide ranging agenda? 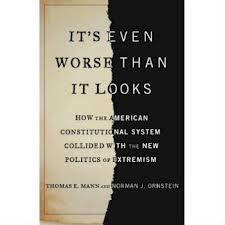 My own first impression was that Mann and Ornstein have done us a service by combining a hard-nosed professional assessment of the shortcomings of American politics with so many good ideas (and their sources) about how to address them in one readable, reasonably short book. I was not familiar with many of the initiatives they propose and I do not have the space here to do justice to the nuances involved. I now have my reading set out for me and a lot of thinking to do. That almost defines what a good source on our politics should do today. On second thought, however, I was struck, like some other reviewers, by how unlikely it was that many of these reforms would be enacted if the Republicans could find a way (easy enough, as Mann and Ornstein point out) to stop them. With some exceptions – it might be possible, for instance, to get the states to agree on a scheme to provide electronic voting nationwide if the federal government would foot the bill – I think the answer is obvious. And, I have to say, so is the solution: victory for one party or another. Here is where I think Mayhew is right. The United States has indeed gone through some rough patches and, with the exception of the run-up to the Civil War, has come through them. The way that happened was by one party establishing electoral and policy hegemony and the other seeing no way to assault it successfully. The minority party then got a choice: always lose, or cooperate for partial victories. The result has been the kind of policy compromise seen before in long periods of our history. That choice is what is not on offer today, but it seems to be what Mann and Ornstein are actually calling for, especially in their pleas for voters to punish the Republicans for their radicalism. And, paradoxically, I think the emergence of responsible parties (the Democrats are changing too) may be the only way for such hegemony to emerge. We are not going to change our constitutional system, but a string of one-sided victories for one party or the other powered by an electorate that finally realizes that votes have policy consequences could restore it. The problem – and Mann and Ornstein correctly fear this – is that such political hegemony may not be possible in an institutional environment as dense as we have today (Skowronek 1997). The lack of a conclusive victory one way or the other could lead to, as they point out, relentless policy recycling in the face of extreme economic challenges that could render the country completely ungovernable and wreck the entire political economy. The 2012 presidential election may have quieted such fears somewhat, but developments since have not been as encouraging. I think this book will be a source of continuing scholarly and popular debate for some time. Popularly, Mann and Ornstein’s writing skills and professional expertise make their views hard to ignore; indeed, one can already see changes in media coverage tracking some of their recommendations since the 2012 results came in. Further, their indictment of the Republicans as an “… ideological outlier” is obviously beginning to chafe the party’s leadership. I think the book will attract scholarly interest as well. Those studying law and politics would be hard pressed to find an examination of [*180] contemporary suggestions for legislation to bring our constitutional order into line with our political processes that is as comprehensive, as well argued, as well sourced, and, again, as well written. Finally, I think Mann and Ornstein’s work would be an excellent supplementary text for advanced undergraduate and graduate courses, especially those on Congress, political parties, or elections. Students could benefit considerably from reading it, especially if it was paired with new work on the unorthodox legislative procedures now dominating our policy making or more polemic writings about partisan gridlock. I should also mention that the book is reasonably priced; i.e. there is a good chance that the students will actually buy it and read it. For all these reasons, I think Mann and Ornstein deserve our thanks for writing this book and our admiration for being tough enough to do it. Mayhew, David. 2011. Partisan Balance: Why Political Parties Don’t Kill the U.S. Constitutional System. Princeton: Princeton University Press. Skowronek, Steven. 1997. The Politics Presidents Make: Leadership From John Adams to Bill Clinton. Cambridge: Harvard University Press. Citizens United v. Federal Election Commission 558 U.S. 310 (2010).